We’d love your help. 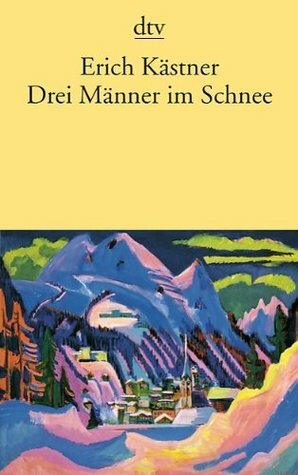 Let us know what’s wrong with this preview of Drei Männer im Schnee by Erich Kästner. To ask other readers questions about Drei Männer im Schnee, please sign up. Recommended to Matt by: Uncle W.
I never awarded Kästner less than , and I'm not going to start now. K sighed and poured himself another drink. He raised the half empty glass against the light in his study and watched the oily streaks moving around in the brown liquid. He sighed again and downed the drink. The familiar warmth was comforting. What a grotesque year this has been. He recalled the night in January, the “seizure of power”, as they call it, and shortly after that the “law to remedy the distress of people and I never awarded Kästner less than , and I'm not going to start now. K sighed and poured himself another drink. He raised the half empty glass against the light in his study and watched the oily streaks moving around in the brown liquid. He sighed again and downed the drink. The familiar warmth was comforting. What a grotesque year this has been. He recalled the night in January, the “seizure of power”, as they call it, and shortly after that the “law to remedy the distress of people and Reich”. A grandiloquence if there ever was one. Then in May the book burnings. What an outlandish sight to see. “No to decadence and moral corruption!” the pulpiteer had said, and “Yes to decency and morality in family and state!” A fiery address indeed, and K had to watch it. And after that? Publication ban – self-imposed exile – stagnation. What’s a writer supposed to do other than writing? Stagnation? No – he decided. He had to write something. Right now. K grabbed the vanilla folder lying next to his typewriter, in which he collected clippings from news papers and other notes. He vaguely remembered a story he published some years back, something with fire in its title. Perhaps he could use this story as a starting point? After a few minutes he found it. “Inferno in the Hotel” it’s called, and it’s about a poor man in a luxury hotel who was bullied by the other guests and the personnel just for being poor. And how did the poor man got there in the first place? He won a contest, and the first prize was a 10-day-stay in the hotel. But the ending is too depressing, K realized. The whole story is just too bleak. He didn’t want to write another bleak story. His own situation was dire enough as it was. He wanted to write a comedy. Something for people to laugh about. The premise of “poor meats rich” is good, but he has to find a lighter tone. If everything else fails you can always resort to humor, he thought. It’s a weapon the brown shirts simply don’t quite get and have no way of fighting. K smiled for the first time in months. He had no idea yet how this new book will ever get published in his home country. But he was still allowed to publish abroad. So perhaps his publisher in Switzerland knows a way? Of course the book will have to pass the censors first. But he will deal with that problem later. First he had to think of a plot. The next morning K woke with a splitting headache. He went over to his desk and looked at what he wrote last night. Mostly dialog, it seemed. Reading it had a sobering effect. He wondered how much drinks he had the night before. This reads more like a cheap stage play than the serious comedy he had in mind. A drollery. The characters seemed childish and silly to him. K decided to start over and just as he was about to trash the stack of papers an idea struck him. Maybe he should really write a play and not a novel? He had done that before and the audience loved it. People are so easily amused. The sillier the better. Publishing a play was a lot easier than a novel and the censors are usually not as strict with plays. Of course he still had to use an alias – the publishing ban extends to writing plays as well – but it was much easier. And he already had an idea. His old school buddy B. from Dresden wrote plays in the past under the name Robert Neuner. And B. was still allowed to publish. Furthermore he was a member of the Reichsschrifttumskammer (of all places – the lion’s den). So K called up his old friend and asked him if B. would allow him to write a play under the name Robert Neuner and B., feeling honored, joyfully agreed. K wrote the play in a few days, and gave it the title “The lifelong child” referring to the main character, the rich man in the poor man’s clothes. And although his play was well received by the audience and stayed on the repertoire of the theaters nationwide for quite some time, K wasn’t fully satisfied. He still wanted to write his comedy in novel form, and he still wanted his novel to be published in his own country, giving those in power a wipe, however small that might be. But K wouldn’t be K if he hadn’t an idea how to achieve just that. First he had to rewrite the play into a novel. This wasn’t too hard. K renamed some of the characters, added some scenes, deleted a few others, and polished over the whole plot. It was still sort of silly in some parts, and many of the jokes probably won’t stand the test of time, but K didn’t mind. At least it was written in K’s usual style, and all he wanted to do was to get this book out. Finally he added a foreword, something that he always does. He gave it the title “The millionaire as an artistic motif” and hoped it sounded boring enough for the censors to just skim it. And even if they read it thoroughly they won’t find anything in this foreword to complain about. And then he added a second foreword: “The author states his sources”. K figured this should make the censor to just skip it. Who wants to read about sources when there’s a whole novel to be read and scrutinized? K knew he was gambling here, but it was a risk he was willing to take. In the second foreword he wrote a brief story of how he (the anonymous author) and his friend Robert (which refers to Robert Neuner of course) met a man on a train who told them the story of the “Three men in the snow”. The author and Robert were intrigued and saw potential for a play as well as for a novel. Anyone who read the foreword must think that the author and Robert Neuner were in fact one and the same person. And since the fictional Robert Neuner was already accepted as the author of the play, K was quite sure the novel will pass without complains. And so it did! K finally had his novel out in his own country and circumvented the ban on him in quite a clever way. A young, unemployed PhD publicist in Berlin named Hagedorn wins a newspaper contest for writing jingles for a huge corporation. The prize is a vacation with all expenses paid at an elite hotel in the German Alps catering to old monied privilege. He can’t get a job, but he seems to win every newspaper contest under the sun. The owner of the corporation, Tobler, also enters the contest under an alias and wins second prize, which includes a stay at the same hotel. Since he wants to mingle among the A young, unemployed PhD publicist in Berlin named Hagedorn wins a newspaper contest for writing jingles for a huge corporation. The prize is a vacation with all expenses paid at an elite hotel in the German Alps catering to old monied privilege. He can’t get a job, but he seems to win every newspaper contest under the sun. The owner of the corporation, Tobler, also enters the contest under an alias and wins second prize, which includes a stay at the same hotel. Since he wants to mingle among the little people—I know, I know, if he wanted to do that, why would he want to hang out at a bunch of rich folks?—he decides to show up as a downtrodden prole. He brings along his butler, whom he outfits with the best wardrobe available and passes off as a shipbuilding titan of industry, with the charge that no one at the hotel should know of their connection. Tobler’s daughter calls the hotel to let them know of his plan. They, however, mistake Hagedorn as the millionaire and provide him with the best room, service and amenities while they mistake Tobler for a downtrodden interloper. Hilarity ensues, the two prizewinners and the “shipbuilding magnate” become fast friends. The plot is predictably sweet and funny, yet its inevitability, much like the best of Wodehouse, in no way lessens its charm. When I read Drei Männer im Schnee (Three Men in the Snow) for the first time a few years ago, it made me smile and chuckle. The innocence of the story is addicting escapism. But there is actually more to it than one would assume. The author Erich Kästner had, only a few years earlier, written one of the great existentialist novels of the interwar period, Fabian. Because it was considered “degenerate” by the Nazis, it was one of the books burned at the May 10, 1933 book burning demonstration at led by Joseph Goebbels next to the Berlin Opera House. K Kästner stner was the only author who actually witnessed the event. He was one of the few authors who chose “inner emigration” over exile, one of the few who survived the Third Reich and maintain his integrity and reputation after 1945. He adapted by writing light comedy, youth literature and fairy tales—all of which continue to sell well today. Emil und die Detective is widely used in intermediate German high school and college classes in the U.S.
Drei Männer im Schnee becomes more meaningful when considering it was Kästner’s first novel published under the draconian rules of Nazi Germany. It was a rare thing for enartete authors to be allowed to write, much less publish. As I reread the story this time, I did so with this knowledge, which made the delight of finding some subversive nuggets that escaped notice of the censors even more joyful. In a world in which state propaganda was mocked by many in private, many readers must have deciphered Kästner’s subversive mocking in „Dann lügt eben die Zeitung,“ meinte Frau Kunkel. „Das soll es geben.“ (“Then the newspaper must be lying,” opined Mrs. Kunkel. “That’s known to happen.”) Or when some books were deemed to be threat to the state, one if the censors were in on the joke, „Vielleicht liest er zu viel. Das soll sehr schädlich sein.“ (“Perhaps he reads too much. That’s supposed to be very dangerous.”) They certainly must have recognized the rebellious double entendre when the two prizewinners send off their friend to his ski lessons with a „Ski Heil!“ (Heil, as in hail, has a German synonym that also means intact or unharmed.) The most obvious message is a Hagedorn musing on how he would tell the real Tobler how publicists like him have more power than is apparent. Wir Propagandisten sind Feldherren; aber unsre Armeen liegen, sauber gebündelt, in Ihren Geldschrank. Ohne Truppen kann der beste Stratege keine Schlacht gewinnen. Und Reklame ist Krieg! Es gilt, diese Köpfe zum Besten Gebiet zu machen, Herr Geheimrat Tobler! Man darf die Konkurrenz nicht erst auf dem Markt, man muß sie bereits im Gedankenkreis derer besiegen, die morgen kaufen wollen. Wir Werbefachleute bringen es fertig, aus einem Verkaufsartikel, der dem freien Wettbewerb unterliegt, mit Hilfe der Psychologie einen Monopolartikel zu machen! One wonders if Goebbels mistook sarcasm for praise. Още в началото за пример искам да цитирам поне един диалог, който за четвърти път чета, но пак ми е смешен (не зная с какво). (view spoiler)[„— От утре трябва да започна да карам ски. Само че не знам как става това. Смятате ли, че все пак ще мога да се науча? — Но разбира се! — заяви чичо Полтер. — Какви хора са се научили тук! Най-добре е да вземете частни уроци при Тони Грасвандер. Тогава той ще може да ви отдели повече време. Пък и по-приятно е, отколкото в големите курсове, където непрекъснато трийсет души ще зяпат как ще се изтърсите на земята. — Кой ще се изтърсва? —попита той предпазливо. — Вие — констатира портиерът. — И то с цялата си дължина. — Много ли е опасно? — Не особено — рече портиерът. — Пък и ние, в Брукбойрен, имаме отлични лекари. Санитарният съветник доктор Цвизел например се слави из цял свят със своето лечение на сложни костни счупвания. Краката, попаднали в неговата клиника, след това изглеждат още по-красиви, отколкото преди! Иначе не зная дали една „чисто хумористична“ книга би ми харесала толкова. Все търся и сериозното в подобни романи/разкази и може би именно тази комбинация ме привлича. Отново за пример – един от най-трогателните за мен диалози (наравно с онзи за прословутия пилешки бульон от „Зуи“ и още един, между Флорентинка и Клоска от „Правек и други времена“). (view spoiler)[„Щулце и Хагедорн стояха сами под нощното небе. Държаха в ръце полупразните си чаши. Мълчаха. Бяха прекарали твърде весела вечер. Но внезапно двамата мъже бяха станали доста сериозни. Разделяше ги съвсем леко подвижна завеса от снежинки. — Откакто участвах във войната, не съм говорил вече на никого на „ти“. На жени — е, да. Има ситуации, в които, ако кажеш „вие“, звучи лошо. Бих желал, моето момче, ако нямаш нищо против, да ти предложа да пием сега за побратимяването. — Откакто завърших университета, не съм имал нито един приятел. Никога не бих дръзнал да ви помоля за приятелството ви. Човече божи, благодаря ти! — Казвам се Едуард — представи се Шулце. — А аз — Фриц — рече Хагедорн. Сетне се чукнаха, пиха и стиснаха ръцете си. Изобщо отношенията между тримата мъже наистина са центърът на тази книга – ясно е от заглавието. Щулце и Хагедорн – мед да ти капе на душата от такова спонтанно и взаимно привличане. Толкова им вярвах на „надушването“, че след разкриването на действителното положение не се изненадах, че няма разочарование и промяна в отношенията. Любопитно ми беше как ще реагира Хагедорн, но на секундата си спомних онези дни в хотела и развръзката беше потвърждение на истинността на „надушването“ между двамата. Любовта – мааалко по-издишащо ми прозвуча в началото историята между двамата нововлюбени. Но при тази лека старомодност (макар че да решиш да се ожениш след един ден познанство си е по-скоро революционно), при тази лека идеализираност (но отново с щипка духовитост) – допуснах, че Кестнер иска да представи любовта в „изчистен вид“. Тази, на която сме забравили да вярваме – без излишните съмнения, опасения, напъване за доказване на нещо… Леко наивно може да изглежда всичко, но аз обичам този наивен Кестнер, напомня ми за онази чиста доброта, позната и от любимата ми „Хвърчащата класна стая“. Заради тази чистота и освободеност от сложности и при любовта на младите не ми беше интересен аспектът „беден/богата“. (view spoiler)[ При преписването на откъсите се сетих, че съм виждала книгата онлайн и реших да копирам от там. Сверих изданията от 1983 г. и 2006 г. (чета второто) - един и същ преводач (Владимир Мусаков – той всъщност е починал през 1966 г. и сигурно има още по-стари издания). Много интересно беше да сравня малкото на брой изменения. Може би това се нарича „осъвременяване“? Интересно съвпадение, че в момента превеждам текст за преводачите на ХЛ и там се споменава именно тази потребност от актуализация на стари преводи… Не знам дали на сегашните преводачи би им било приятно да си представят, че след 50-100 години ще има нужда техните преводи да се осъвременяват. Но поне този конкретен случай на мен ми допадна. Нов поглед върху детайлите, не само думите, а и словореда - тънкости, но важни. Сега хем звучи добре за съвременния читател, хем не се губи онова специфично настроение от първата половина на 20-ти век. Някои примери за старо/ново: сетне/после, след това; откак/откакто; като/когато; отбеляза Шулце/представи се Шулце; Вече питаха за вас — каза младият човек./Вече питаха за вас — увери го младият човек. и т.н. Още една книга на Кестнер, чрез която става ясна силната връзка на писателя с майка му (може би прекалено силна). Затова след тази живителна книга (за мен не е просто лека и забавна), въпреки че ми се чете пак нещо весело, ще започна планираната „Животът е другаде“ на Кундера. Чух, че там има една обсебваща сина си майка. При Кестнер обаче не усещам критичност в това отношение, само мека ирония. Първата ми среща с произведение на Ерих Кестнер може да се сравни с вкусен, лек десерт след обилна вечеря. Нискокалоричен, лесносмилаем, изключително свеж и приятен, към който веднага се пристрастих и не можах да оставя от началото до края. Съставките са прости, но внимателно дозирани, майсторски забъркани и поднесени фино, непретенциозно, ненатрапчиво и елегантно. Без излишни декорации. С очакване за нова прелест, посягам към нова порция Ерих Кестнер. A tremendously cute novel, without any drama or seriousness. The plot deals with three men who play around in the snow, cuddle with kittens, drink expensive booze and get into sarcasm matches with snooty servants. Pretty much the German equivalent of a P.G. Wodehouse novel. Highly recommended if you like sweet, short interbellum fiction. خيلى داستان بامزه اى بود. ترجمه فوق العاده، تم بامزه ى برف و محفل گرم دوستانه، و موضوعى كه گرچه خيلى تكرارى بود، اما فوق العاده جديد به نظر ميرسيد. منظورم اينجاست كه اين بحث مبدل پوشى از سلطان محمود غزنوى تا شاه طهماسب در ادبيات ما بوده و به ما شادمانى بخشيده 😊 اما از اين داستان بى نهايت لذت بردم. Zeitlose Sozialstudie darüber, wie die Gesellschaft mit Vorurteilen von Reichtum/Armut agiert, aber so humorvoll und mit viel Herz erzählt, da macht das Lesen einfach Spass. Die Freundschaft zwischen den drei Herren ist einfach wunderschön. Die Filmadaption von 1955 kann ich auch wärmstens empfehlen. Забавна без да е смешна. Една много луда книга, от която направо капе смях. Не можете да 6963317 сравните Кестнер нито с Пратчет, нито с Удхаус, стилът му на писане е толкова забавен и по линията на черният хумор толкова непретенциозен, че книгата просто ви се услажда. Тайният съветник Тоблер е милионер, който живее в къща с икономката си Кункел, стария прислужник Йохан и дъщеря му – Хилде. Тази сбъркана комбинация е напълно подвластна на прищявките на богаташа и те стават жертви на поредната негова измислица. „ – Икон Една много луда книга, от която направо капе смях. Не можете да 6963317 сравните Кестнер нито с Пратчет, нито с Удхаус, стилът му на писане е толкова забавен и по линията на черният хумор толкова непретенциозен, че книгата просто ви се услажда. Тоблер изумително печели втора награда от конкурс на собствените си заводи, участвайки под чуждо име. Наградата е екскурзия в Алпите. Но всичко едва започва. Хрумва му лудата идея да си направи голяма шега на тази почивка. Иска да се представи като абсолютен бедняк и да види какво ще направят тези в хотела. Но това не е всичко - той взема иконома Йохан със себе си и му заповядва да се представя за богаташ под името Кеселхут. Уви обаче, опитът още преди да пристигне, е осуетен. Кункел и Хилде се обаждат в хотела и подшушват, че той е милионер, който ще се представя за бедняк. Казват им за всички удобства, които той обича и мълвата се разнася от уста на уста. Но искаш ли, Фриц Хагедорн – първият спечелил – пристига пръв и всички вземат него за мнимият милионер. Жените започват да му се лепят като мухи на мед, всички му се умилкват и не спират да твърдят, че си играе много добре ролята, докато той се чуди какво правят три котки в стаята му и защо масажиста, който никога не е поръчвал, му е раздробил кокалите без никой да му нарежда така. „ – Какво ще крадете? – полюбопитства Ленц. - Голям контингент леви ръкавици – каза тайнствено Хагедорн. Толбът пък зъзне в таванско помещение с един прозорец, който при отварянето си изсипва сняг от покрива върху теб. Стаята, където нито камериерка, нито камериер биха издържали. „ – Симпатична стая ли ви дадоха? – поинтересува се прислужникът. Но докато всичко върви по план и директора на хотела кара Тоблер или по-скоро мнимият Шулцер да чисти сняг от пързалката, да ходи до селото, да пазарува и да окача бельо за украса, само за да го накарат да си тръгне, се случват още неочакваности. Хилде и Кункел пристигат в хотела. Фриц заявява, че е влюбен в Хилде и иска да се ожени за нея. Тайният съветник насмалко не припада, виждайки цялото си домочадие да се преструва, а по-късно идва новината и че Фриц е назначен в заводите на Тоблер и има пари, с които може да се ожени за Хилде. Какафонията е пълна! „ – Аха! Значи така ти изнася, а! Отвратителен егоист! Всички мъже са егоисти. Четох една книга. В нея го пишеше. „Стопанският капитал и моногамията”, така се казваше книгата. Вие сте коварен, дребнав пол, бррр! – Хилде се разтърси като мокър пудел. – Четири месеца бихме могли да живеем от този пръстен! В тристайно жилище с индиректно осветление! Включително централното отопление и асансьорът. А през неделните дни бихме могли заедно да зяпаме през прозореца! Но не! Ти предпочиташ да ме натикаш в консервена кутия като млад зеленчук! Докато управниците на хотела, заедно със Смелия Карл и чичо Полтер не изгонват Тоблер от хотела и половината от другите гостуващи си тръгват с него. А после и тайната трябва да бъде разкрита и един хотел да бъде мнимо купен, освен ако той вече не е притежание на Тоблер. Литературата от първата половина на миналия век се е запечатала в съзнанието ми с имената на Кестнер и Чапек, някак не е учудващо, че и двамата пишат и фантастика. В „Трима мъже в снега” няма нищо фантастично, обаче. Уж лековатия комедиен сюжет предлага брутална осмиваща сатира на буржоазното общество, а Кеснер е на обичайната си висота. Няма такива диалози на друго място, няма така точно прицелени думи, няма такъв лек и незлоблив хумор. Започнах да се хиля още на въведението и не спрях до затвар Литературата от първата половина на миналия век се е запечатала в съзнанието ми с имената на Кестнер и Чапек, някак не е учудващо, че и двамата пишат и фантастика. В „Трима мъже в снега” няма нищо фантастично, обаче. Уж лековатия комедиен сюжет предлага брутална осмиваща сатира на буржоазното общество, а Кеснер е на обичайната си висота. Няма такива диалози на друго място, няма така точно прицелени думи, няма такъв лек и незлоблив хумор. Започнах да се хиля още на въведението и не спрях до затварянето на последната страница. Един милионер решава да отседне инкогнито в скъп зимен курорт, правейки се на бедняк спечелил рекламен конкурс. След едно грешно разбрано обаждане от дъщеря му към администрацията на хотела, се стига до низ от забавни ситуации, достойни за перото на Шекспир. اريش كستنر هرگز نا اميد كننده نيست هميشه قدم هاي مختص به خودش رو تو روايت داستان داره كه شگفت زده ات ميكنه. کتابی که در یک شب پای شومینه باید خوندش! مادر از پنجره او را با نگاه بدرقه کرد. مادر با خود گفت:"باز قوز کرد.وقتی قوز می کند علامت این است که غصه دار است!" داستان قشنگی بود پایان شیربن و خوش...از اینا که کلاغ به خونش رسید! داستان با مزه و پر ماجرایی دارد. ترجمه عالی بود. Redzētā teātra izrāde ir gandrīz vārds vārdā grāmatas saturs. Viegls humors, tiešām asprātīga komēdija. Varētu teikt, ka šī paša autora Emīls pieaugušajiem. Vienkārši un saprotami! Ich ließ Drei Männer im Schnee von Erich Kästner dieser letzten Quartal. Es ist 107 Seiten und ist sehr lustig überall. Es gab viele Wörter die ich nicht gewusst habe. Zum beispiel; lernte ich, dass “soeben” einfach “nur” bedeutet. Auch, lernte ich, dass “allerdings” einfach “wirklich” bedeutet. Wie ich schon gesagt habe, das Buch ist lustig. Aus diesem Grund, der Genre ist Komödie. In die Geschichte, Edward Tobler gibt vor, arm zu sein, wenn er wirklich reich ist. Seine Tochter mag das nicht und Ich ließ Drei Männer im Schnee von Erich Kästner dieser letzten Quartal. Es ist 107 Seiten und ist sehr lustig überall. Es gab viele Wörter die ich nicht gewusst habe. Zum beispiel; lernte ich, dass “soeben” einfach “nur” bedeutet. Auch, lernte ich, dass “allerdings” einfach “wirklich” bedeutet. Wie ich schon gesagt habe, das Buch ist lustig. Aus diesem Grund, der Genre ist Komödie. In die Geschichte, Edward Tobler gibt vor, arm zu sein, wenn er wirklich reich ist. Seine Tochter mag das nicht und sie macht es ihrer Mission, ihn zu belichten. Im Resort, wo Tobler seinen Status fälschen, macht er neue Freunde. Sie beinhalten Fritz Hagedorn und Johann Kesselhuth (Toblers Diener). Durch Extreme wurde gezeigt, dass Geld und Status sollen nichts mit Freundschaft zu tun haben. Dieser Moral ist sehr offensichtlich. Ich habe dieses Buch gewählt weil es lustig aus sah. Doch, ich blieb wegen des tollen Thema. Der Humor lässt das Buch einer leicht fühle, aber der Symbolik ist tief. یک کارخانه پودر شوینده در آلمان یک مسابقه تبلیغاتی برگزار می‌کند و جایزه‌ای که برای دو نفر اول این مسابقه تعیین کرده است دو هفته مسافرت مجانی به کوه‌های آلب و اقامت در هتل‌های مجلل آنجاست. نفر اول برنده این مسابقه پسری تحصیل ‌کرده و فقیر است که هنوز کار مناسبی ندارد و نفر دوم یک رئیس کارخانه به نام توبلر است که با نام مستعار در مسابقه شرکت کرده است و قصد دارد بصورت ناشناس همانند یک فرد معمولی مسافرت کند و زندگی را از زاویه‌ای جدید تجربه کند. وی از پیشکارش می‌خواهد بصورت یک پولدار ناشناس به این مسافرت بیاید تا از دور مواظب وی باشد. Lovely little story - made me smile a lot, and even laugh out loud at times! Picked this up out of nostalgia, after having read and loved "Das Doppelte Lottchen" and "Der 35. Mai" in my childhood and I wasn't disappointed, his humour works at all ages. مال دنیا اغلب لبخند خداست به کسانی که از جهات دیگر دستشان کوتاه مانده است! Изследване за начина, по който обществото робува на предразсъдъците и прозрението, че приятелството няма нищо общо със същото това общество, а се отнася до хората. Лек и приятен стил с доста натоварваща символика. Но това е Кестнер. Erich Kästner (1899 – 1974) was a German author, poet, screenwriter and satirist, known for his humorous, socially astute poetry and children's literature. A stout pacifist and democrat, he was expelled from the national writers' guild during the Nazi era, with many of his books being burned in public. Today, he is widely regarded as one of Germany's most prolific and beloved children's book author Erich Kästner (1899 – 1974) was a German author, poet, screenwriter and satirist, known for his humorous, socially astute poetry and children's literature. A stout pacifist and democrat, he was expelled from the national writers' guild during the Nazi era, with many of his books being burned in public. Today, he is widely regarded as one of Germany's most prolific and beloved children's book authors. “- Да не сте изчадие на ада, господине? - Не – отвърна непознатият, - аз съм масажистът. Казаха ми да дойда. Името ми е масажистът Щюнцер. - Масажистът кръщелното ви име ли е? – попита младият човек. - По-скоро професията – отвърна другият и удвои нападателните си усилия. Не изглеждаше разумно да дразниш господин Щюнцер. Аз съм в ръцете му – помисли си Фриц. – А пък той явно е от раздразнителните масажисти. Ако го обидя, ще ме съсипе от масаж. “— А сега поразкажете ми нещичко от вашите любовни афери! Какво искаше онази чернокоса красавица, която дойде на терасата, за да бди над съня ви? — Тя е някоя си госпожа фон Малбре. И аз трябвало на всяка цена да я спася. Била от онези жени, които се изравняват с интелекта на човека, в когото в момента са влюбени. По такъв начин станала повърхностна, от което иска да се отърве най-накрая. И за това лечение се нуждае от образован, духовно издигнат човек. Този човек съм бил аз! — Бедничкият! — каза Шулце. — Пък и белята е, че тази особа е хубава! Е, а блондинката от Бремен, и тя ли иска да я спасяват? — Не. Госпожа Каспариус е за по-прост начин. Тя твърди, че ние двамата сме млади, че си нямаме работа и че било грях, ако си откажем един другиму нещо. Още снощи искаше да види трите сиамски котки. — Внимавайте, внимавайте! — каза Шулце. — Коя от двете ви харесва повече? — Не ме бива много по флиртовете. И бих искал да си остана такъв. Не ме блазнят вече преживявания, за които след това се ядосваш. От друга страна: щом като си наумят нещо, жените обикновено го вършат. Я кажете, Шулце, не бихте ли могли да бдите малко над мен? — Като майка — заяви патетично събеседникът му. — Няма да допусна лошите жени да ви сторят нещо. — Сърдечни благодарности! — възкликна Хагедорн. — А сега за награда ще получа във вашия салон един коняк. Когато рине сняг, човек ожаднява. Освен това трябва да кажа добър ден на котенцата. Как са те?